Khrapovitsky, Antonii (Aleksei) [Xrapovickij, Antonij (Aleksej)], b 17 March 1863 in the village of Vatgino, Novgorod gubernia, Russia, d 8 August 1936 in Belgrade. (Photo: Antonii Khrapovitsky.) Russian Orthodox metropolitan, ultraconservative Russian church and civic leader. 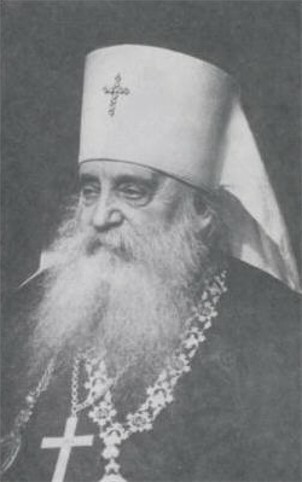 In 1902 he became the bishop of Volhynia (see Volhynia eparchy); in 1914, the archbishop of Kharkiv (see Kharkiv eparchy); and in 1917, the metropolitan of Kyiv (see Kyiv metropoly). He was known for his hostility to the Ukrainian national movement. In 1917–18 he staunchly opposed the proponents of an autocephalous Ukrainian Orthodox church. He was removed from his post by the government of the Directory of the Ukrainian National Republic in December 1918. From 1921 on he headed the Russian Orthodox hierarchy in emigration. Khrapovitsky is the author of many works on Eastern Orthodoxy. A nine-volume biography was published in 1956–63 by Bishop Nikon (Rklitsky).